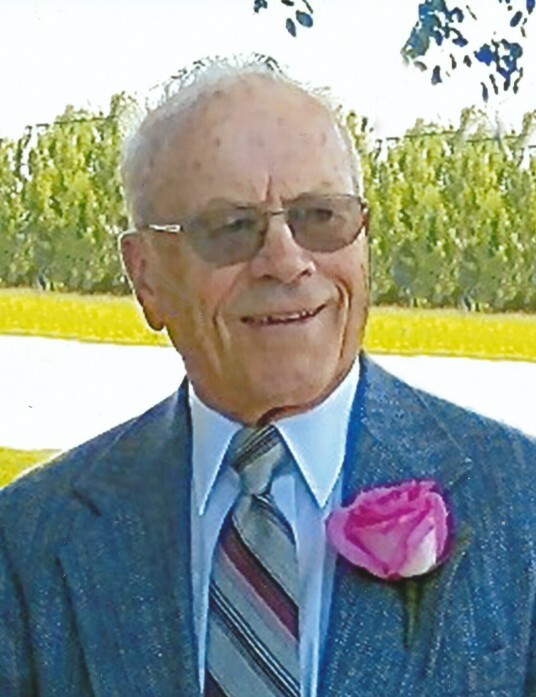 Elton Eliason, 96, lifelong resident of Sturgeon Bay, was called Home to be with the Lord early Tuesday morning, December 4, 2018. He was born October 6, 1922, the son of Eli and Viola (Dalton) Eliason. Elton attended Hainesville School and Sturgeon Bay High School. He took over his grandparents’ farm at the age of 18. Elton operated the farm while also working at Peterson Builders as an electrician. He retired from PBI after 32 years of service. He married Mardell Mae Speerschneider on June 16, 1951 at St. John Ev. Lutheran Church in Valmy. Elton and Mardell remained on the century farm until they sold it in 2007. He grew up attending Hainesville Lutheran Church and later Bay View Lutheran Church where he was currently a member. Elton served on church council at Hainesville and was also involved with the committee to build a new Southern Door elementary school. He enjoyed fishing, gardening, bowling and in his younger years played for the Maplewood Mets. Together, Elton and Mardell loved traveling and visited Europe and most of the states. For many years, they enjoyed wintering in Brownsville, TX and made lasting friends. Elton was a “fix-it man” always repairing and fixing things on the farm. He passed these skills on to his children and enjoyed helping them. Elton was a gentle, soft-spoken man filled with fun and a deeply loving heart who was immensely proud of his family. He will be missed by his wife, Mardell of Sturgeon Bay, with whom he was blessed with over 67 years of marriage; two sons and two daughters, Mary (“Butch”) Hugenroth of Green Bay, Michael (Susan) Eliason, Martin (Roxanne) Eliason, both of Sturgeon Bay, and Judith “Judy” (Jeff) Blackman of Green Bay; eight grandchildren, Yvonne Moore and Angela (Kevin) Vissers, Sarah (Christian “Cricket”) Inbau and James Eliason, Joel (Alecia) and Shane (Brianne) Eliason, and Andrew and Adam Blackman; nine great-grandchildren, Eli, Mya and Cayden, Dawson and Parker, Isaiah, Ava and Jade, and Kai. Elton was preceded in death by his parents; and two half-brothers, Trafford Gregerson and Edgar (Shirley) Gregerson. His life will be honored privately by family with a funeral service held at Bay View Lutheran Church in Sturgeon Bay with Pastor David Raben officiating. Elton will be laid to rest in Bayside Cemetery. Memorials may be given in his name for Unity Hospice. His family would like to extend a heartfelt thanks to the staffs of Unity Hospice and Anna’s Healthcare for the wonderful and compassionate care given to Elton. In addition, special thanks to Pastor Tim Malek for his frequent visits and comforting words. Huehns Funeral Home in Sturgeon Bay is assisting the Eliason family with arrangements. Expressions of sympathy, memories, and photos of Elton may be shared with his family through his tribute page at www.huehnsfuneralhome.com.